I had the most incredible week in my entire life. 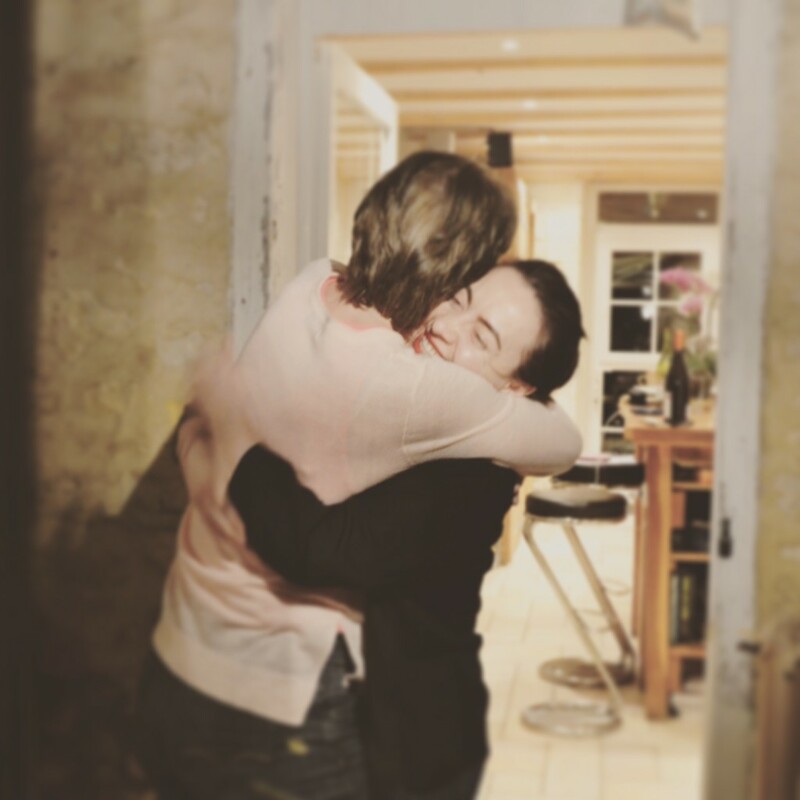 I was invited by the most amazing leadership coach, writer, a divine woman and my lovely friend Mel Carnegie to spend a week in her beautiful house in France and to experience my DeNA LightUp in front of her six gorgeous students. I had no idea what to expect…and was kinda anxious to talk about myself in front of people. Could I speak from my soul? What will I experience? Will they judge me? Will I feel comfortable? Will there be a real result? A thousand questions went through my head the days before I started my journey to France. Context: Mel and I first met at the Lifestyle Design Convention in Zurich but didn’t really talk to each other during the two days, because I was involved in the organization and was focused on my tasks. 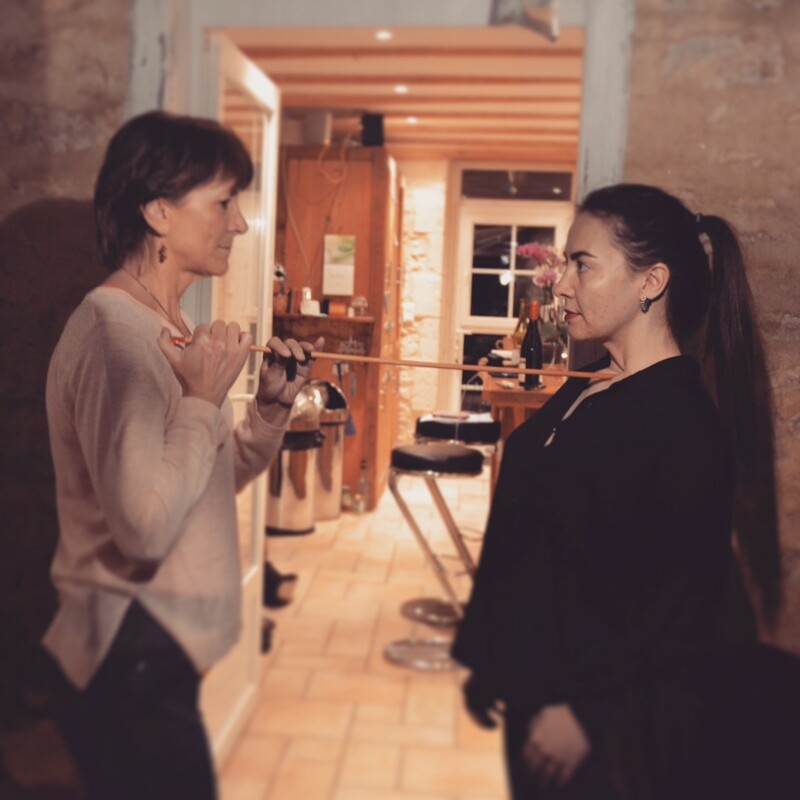 Mel, who was a speaker at our event and arrived with her amazing friend, coach, facilitator and business consultant Hannah Havas was focused on the communication with the attendees. So somehow we didn’t speak a single word there. But we immediately clicked on a deep, invisible level with Mel and Hannah. When Mel gave me a hug (at the beginning and at the end of the event and it was the only contact we’ve had), tears started to run down my cheeks. Happy tears. It felt as if I were home. I knew this energy. So we said au revoir and “accidentally” contacted each other on LinkedIn less than two weeks ago and there I was… sitting in the plane to France towards the unknown journey, which changed everything. I always knew, that there’s more than “just a girl” in me and the last two years I was dedicated to nothing else but seeking. Seeking for the higher purpose, for the universal truth, for the logic, for gurus, for self-development stars, for bloggers, for personal growth events, for spiritual leaders, meditation teachers, yogis, health junkies, for answers which were bothering me all of my life. Sometimes I would be confused, sometimes I would have aha-moments. But most of the time something was missing. Either I was unexplainable sad or I was missing the most unexpected situations or people. Something was continuously missing. Part One – Discovery: When I arrived in Mel’s house it seemed as I would’ve lived there for centuries. Everything seemed familiar. Home. I was waiting to enter this space for years, maybe even lives. I felt so welcome. Mel and Hannah gave me everything, so I could feel the most comfortable. So right away, the next day my LightUp Experience started. Everything Mel and me did or talked about, would happen in front of the gorgeous students. I was a bit insecure, because it’s scary to share the deepest fears in front of other people. The sweetest women I’ve ever met were sitting behind me, making notes and first Mel just asked me to tell her, what I would like to tell. I started to speak. All of my “pain” just flew out of me. I spoke for about an hour, maybe more. I spoke about my greatest fears and concerns. About how I currently feel and what hurdles I see for myself. I spoke about my dreams and about my desires. About my talents and my passions. I spoke about my relationships and my loneliness moments. I was so deeply honest as if I would speak to the mirror. It was so easy to speak from within because Mel and the divine ladies were holding the space for me, so I would feel most safe. I didn’t hold back any emotion of body and mind. I just let myself entirely be. For the very first time in my life I let myself be as I really am. I felt the support of Mel and the other women to have this brave experience. They were literally giving me the unlimited space to meet myself. It was emotional and at a certain point I started to cry. I cried, because I met myself indeed. For the very first time in my twenty seven years I met myself. As I am. Flawed, crying, complaining, dreaming, beautiful, emotional, scared. And I loved myself. I loved every word, I loved the energy, the passion. I loved everything about me. It was the sacred “homecoming” moment. Wow, it was huge. The most beautiful part of it was how supportive every single soul was. I felt zero judgment in moments, where I would even judge myself. I felt a whole-hearted support to be as I am, to say, what’s on my mind, to express myself in every way and they were cheering up for me, sharing their love with me. Because they also have met themselves. It still gives me goose-bumps how a single word gives you the limitless permission or … takes it away. It was so relieving to finally remember and use the words I actually believe in. The power of word is huge. And now I’m even more aware of it. This part was about unlearning the habits of word and thought, which are easily unlearned, once you identify their toxic influence in you life. I had many amazing exercises (alone and in the group), which were beyond any logic. My natural confidence and power was literally streaming out of me during the exercises. What happened there, was what is called magic. And the magic never stopped after it. Part Three – Activate: This part was the most emotional, tough and beautiful one. Mel simply asked me to imagine, that all of my dreams came true yet. Imagining and feeling through it was easy, light and beautiful. Especially after all the soulwork we’ve been through in the previous days. Then the next magic happened and I walked into my light. How it happened and what I felt is just the most incredible feeling I’ve ever experienced. I stepped into my power. I stepped towards myself. I met myself fully. I literally couldn’t move. One can believe it or not. But it was the strongest feeling I’ve ever experienced. After I had my LightUp moment, we just celebrated and had amazing and fun exercises worth mentioning. 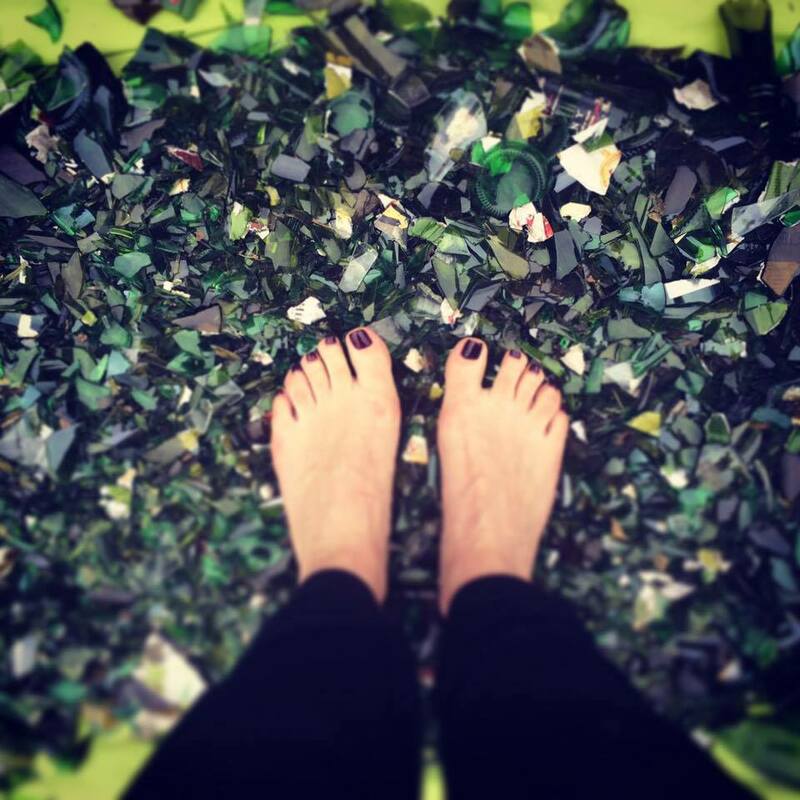 The first exercise was walking on pieces of broken glass. Honestly, I was quite concerned and also afraid to do it. But then I made a decision and just did it. None of us hurt herself. We danced through the glass using our power of body and mind. It was so relieving and also a huge proof, that fears are imaginary and overcoming them is the biggest fulfillment there is. If the mind says “I can” – the body says “I can”. And nothing can stop or hurt us. We have to believe in ourselves. The other exercise was breaking a wooden arrow with the “weakest” point of our throat. So one holds the arrow and I just “step” towards the other person, only pushing the arrow with my throat. I failed two times and I have to admit it hurt very much. I mean a wooden arrow was literally piercing my throat. This exercise demands a lot of trust between two souls and a lot of courage, determination and focus. It’s scary for both. But when both of us were one – I stepped into my fear and broke the arrow just with my throat. Wow, what a feeling. It’s a victory. There is so much wisdom in this exercise. It’s about trusting and helping each other to succeed. And then cheering up for each other. It’s about trusting our own power. We are limitless beings. Limitless. Such a magic moment. 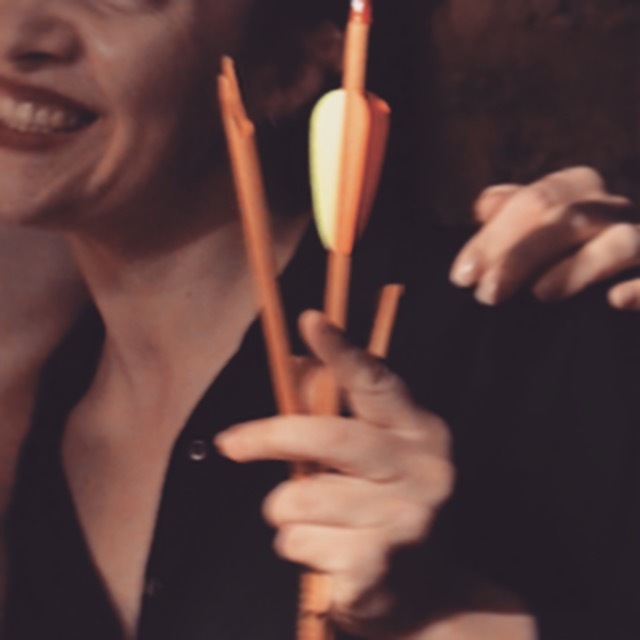 Proof: my broken arrow. Broken with trust, courage and determination. Awwwwwww. Afterword: It’s obvious, that we often live with eyes closed, picking up thoughts the society dictates, picking up professions the society prescribes for us, picking up relationship patterns the society shows us – always somehow believing and thinking something is wrong with us. And we become so unhappy, because we don’t express a dime of who we are. Neither in our professions nor in our relationships. The bravest of us, and I see myself as one of the bravest, dare too see our true nature. It’s the most incredible discovery adventure there is. It’s a tough journey totally worth going. Because on this journey I learned that nothing is wrong with me at all. Because on this journey I learned about my own greatness. And even if it might seem “easy”, to accept myself as a powerful, loving, caring, meaningful human being full of limitless potential is more difficult than anything else. The LightUp Experience gave me the permission to be myself. I’ve never experienced my own self as awesome as I did with those amazing women. That is who I am and that “me” I’m more than ready to love and respect like hell. Mel and the girls helped me to find what I was seeking for, while seeking for gurus and self-development stars. I was looking for the external validation to express myself. I was looking for the external validation to share my multiple gifts. I was looking for the external validation to be the love I am. I was looking for the external validation to have the permission to create as I feel. But all of the external validation was there already all the time. The only validation I was seeking is my own. The sisterhood of such amazing women, such amazing souls was exactly what I needed. Each one of them gave me back what I was missing. This gathering was meant to be. I don’t believe in coincidences. Nothing mattered there, but the soul-connection and the freedom to express ourselves. We connected on such a deep level, it was so emotional and so beautiful. The atmosphere could be described as purest love and support. Zero judgement. We saw each other for who we are. Each one of us was doing her part to create the most amazing space to be in. And it was heaven on earth. To share my deepest truth in front of those amazing, unique, talented women was such a blessing. I totally loved myself while sharing with them and it was so easy. Now I feel so much more confident. I trust myself so much more. I intend to never ever hide again or question my decisions. I know what is right for me and this experience just gave me another shot of validation, that I’m enough. I’m enough and I’ve always been enough. Since I completed the Part One, my mind is so much clearer. I think way less, which is a big gift for me. 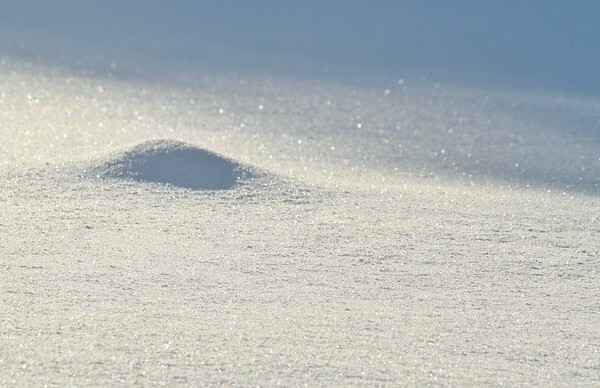 At my first Vipassana Practice I couldn’t shut my mind for ten seconds in ten days. Not kidding. Now I feel so much more at peace. Now I know that I’m okay. And I feel so much better in my skin. In the last years I met the most incredible people, which were a gorgeous reflection of myself. But I never could’ve imagined how much more beautiful my reflection in others can be. It happens if we are surrounded by the right people. If we are surrounded by our people. And to make it happen – we have to choose to be our own right selves first. The funny thing is, that the more honest we became and the deeper we went into our authentic souls – the more and more beautiful each one of us became, the more love we could give and express, the more compassionate we became, the more free we could act. So I choose to drop all of my masks for good. And I’m just endlessly happy to be me. Thank you dearest Mel for guiding me through this incredible journey to myself. Thank you for making it so easy. Thank you for creating the magic space. Thank you for all your love and support. The soul work you do is beyond any comparison. It’s a magic super-speed healing process. I’m so grateful that we finally met. I’m so much closer to who I am thanks to you. And I love it (=me). Thank you from the bottom of my heart my beautiful soul-sisters Hannah, Evelyn, Sarah C., Sarah M., Lucy, Sharon and Leanne to give me the part I was missing so bad. Thank you for showing me who I am now and who I can grow into. Thank you for letting me experience myself. Thank you for listening. Thank you for believing in me. Thank you for giving me the permission to be myself. Each one of you is so beautiful that I need all the tissues in the world to express my love to you.